When I was in Sephora last week I spied this new holiday set from Bite . It's so nicely packaged and that got my attention immediately. First off is the festive box. That holds the tin that holds the lipsticks, with a mirror inside, then there is a paper overwrap and then the 5 mini Bite lipsticks. 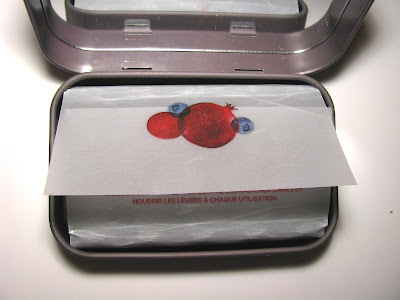 The tin is easy enough to carry in a bag and you can always keep one or two of the lipsticks in it and add in some other musts like band aids and lip balms. It'll fit. These are mini sized and cute with each one being .052 ounces and just under 2 inches. 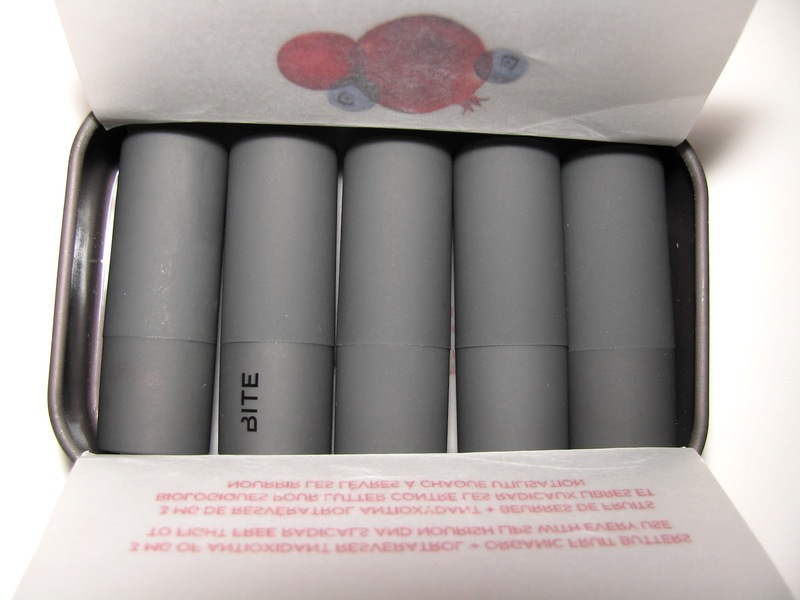 Bite Lipsticks if you haven't tried them are antioxidant rich with resveratrol in each one as well Vitamins E & C and all ingredients are food grade . They are highly pigmented and lightly moisturising with shea butter and argan oil. Not balm level but not a dry formula either. 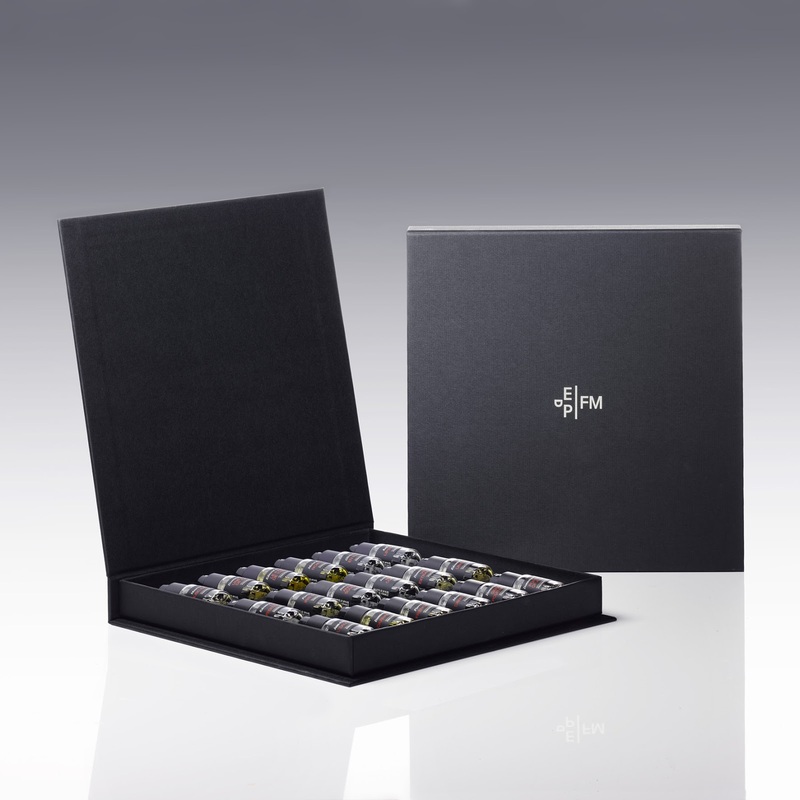 The gift set comes with 5 shades- Retsina, Musk, Shiraz, Fig and Pomegranate, which is the order in the image. This is pretty much one of those stick a bow on it and gift, gifts. Back when mark. 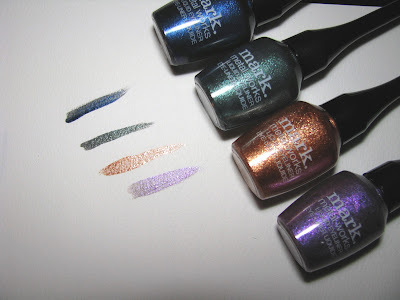 holiday launched I got so into the cute accessories that I didn't get one of my favorite makeup picks from them posted , the Metal Works Liquid Eyeliner. You know me, I love a good sparkly eye. 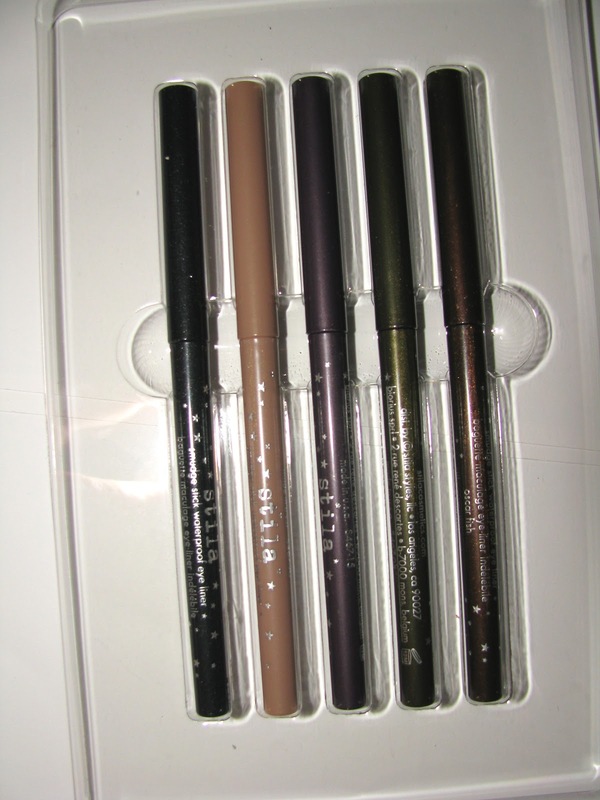 These glitter eyeliners will amp up your holiday look with a little colorful sparkle. They add just enough glitz to your eyeline and with both deep and light shades you can decide how dramatic you want to be. I particularly love the deep green and the light bronze. These are liquid and apply easy. They just glide right on and are pigmented but not super deep pigment, especially on the lighter shades. The brush is very small for a good tiny or tight line. A gift giving truism- it's hard to go wrong with L'Occitane. They have gift sets at many price points and this Hugs & Kisses Duo combines their legendary hand cream and a lip balm in a choice of scents , boxed up for $19. 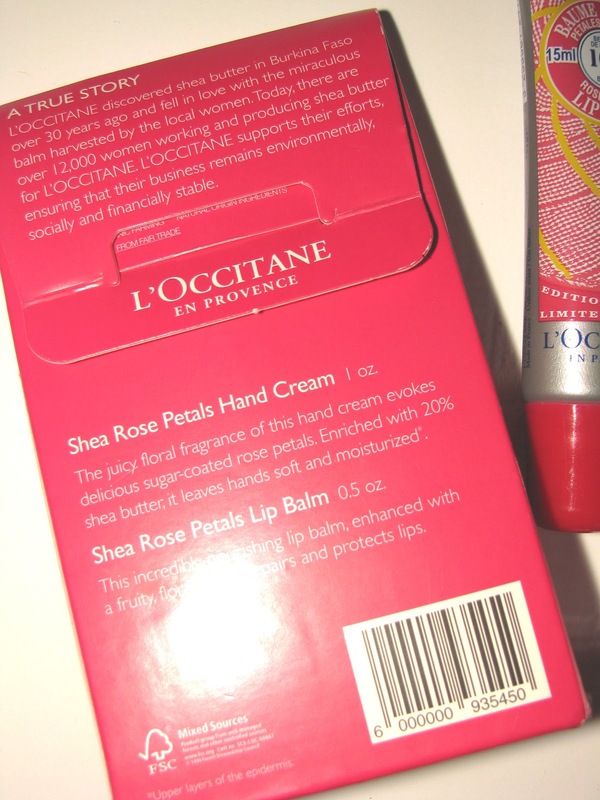 L'Occitane Hand Cream is loaded with shea butter and is truly one of the best out there. The lip balm also has shea butter . There are four scents available - Shea Butter, Date Bouquet , Mango Flower and Rose Petals (shown). The Rose Petals is a soft, pretty scent that has a rosy smell but not a strong one. It's very light and a little fruity as well as floral. 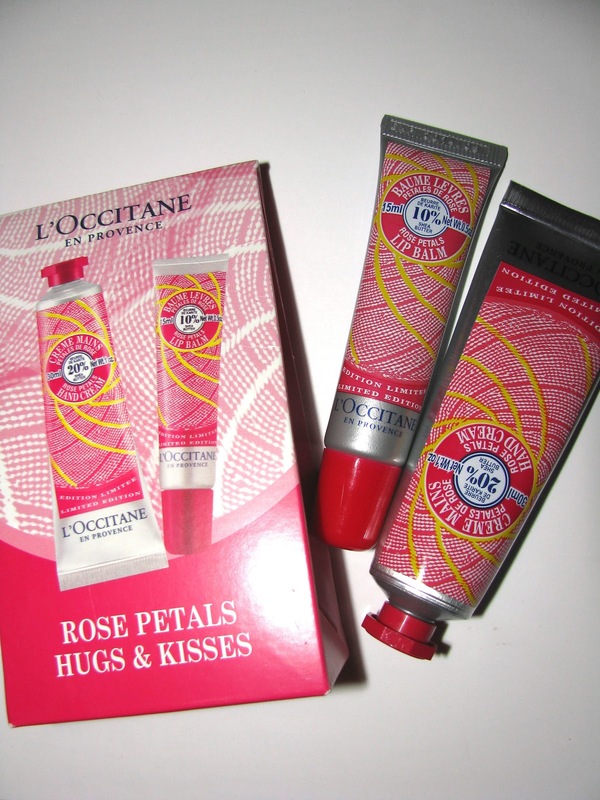 You can also find a nice L'Occitane assortment at Sephora but not this LE set. Caswell- Massey, maker of wonderful soaps, has a new LE holiday/winter fragrance called Pure Frost. Pure Frost comes in a winter inspired box with frosty flowers on a silver background and smells of light white florals , green notes like bergamot and a hint of vanilla and spice. The main florals listed are Indian Jasmine and Casablanca Lily. It's pretty with a crispness to it and not simply all floral. 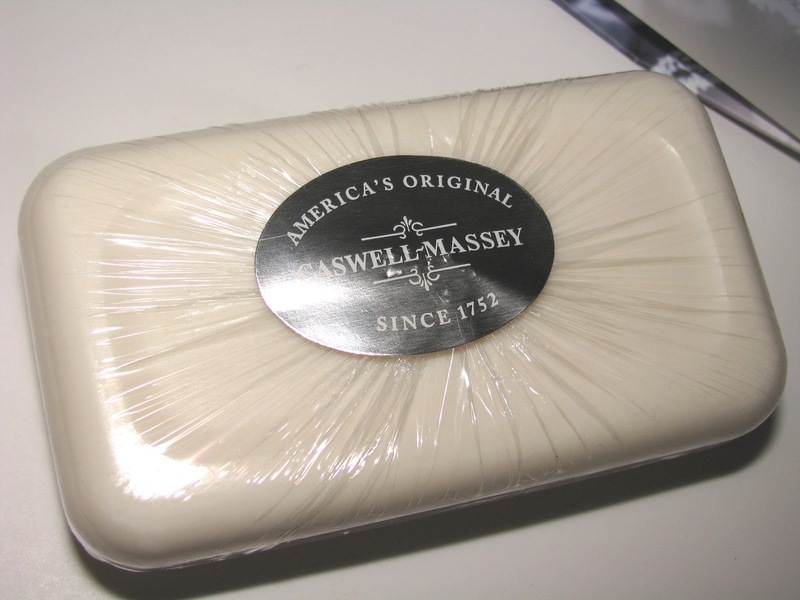 One thing to know about Caswell -Massey soaps is that they are highly scented. As in you can leave them out as a room scent. These are the soaps that hold their scents , which isn't as common as it should be. They are triple milled and highly moisturizing, which is just what we need in the cooler temps. Pure Frost comes in a single gift boxed bar for $ 10 or a box of three ( hostess gift apropo) for $ 28. EDT , Hand and Body Lotion also available. where you call also see Gianna Rose Atelier soaps. Also at specialty shops nationwide. I'm one of those people who likes to have a festive look in as much of the house as possible, even the bathroom and kitchen. 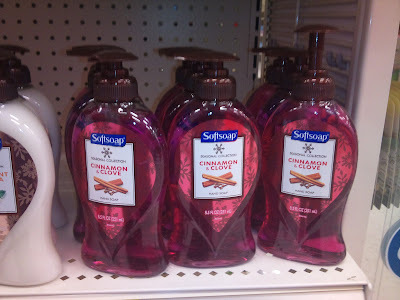 And I love nice hand soaps. So put the two together and you have a winning idea. These LE holiday soaps from Softsoap Scentsations add a little holiday cheer to bathrooms and kitchens. They look not just Christmas-y but wintry, so can be used well into winter. And they smell pretty good too. 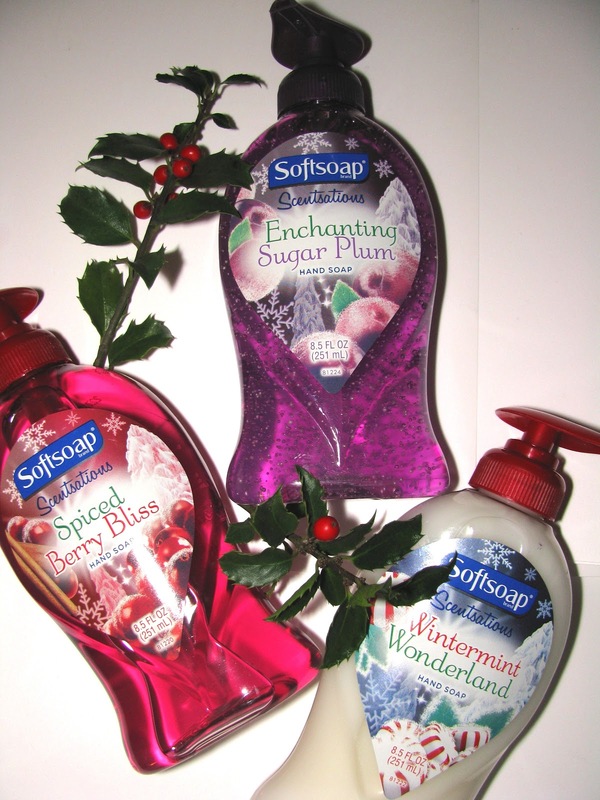 Much like their matching shower gels in the Wintermint Wonderland and Enchanting Sugar Plum fragrances. 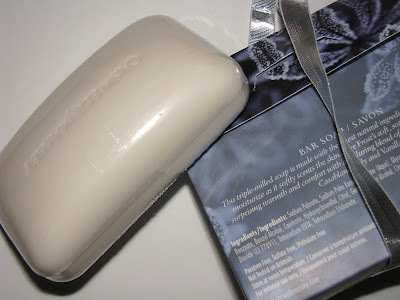 There is a 3rd scent in the soap , an equally nice Spiced Berry Bliss is a mix of cinnamon with a little winter berry. These three bottle designs are exclusive to Wal Mart and sell for $ 2.29. There will also be a Mistletote offered on Cyber Monday for $30 with any $30 purchase ($100 value). These cute and warm slippers are called Posy for their little flower adornment. New from Smart Dogs , what makes these special is what they call Comfort IQ , a temperature regulating technology that stores body heat and releases it when you need it. Sounds crazy but I will say when I wear these my feet don't get as hot and clammy as with many other slippers I have. So maybe there is something to it. These have a hard bottom for outdoor wear and are very comfy. 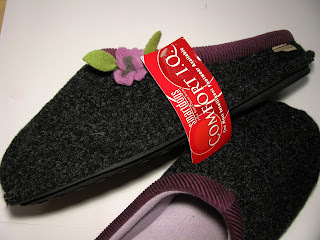 They come in 3 colors , 5 sizes and are $55 wherever Grandoe slippers are sold. Check www.grandoe.com for more info. Tech gloves are pretty much a must these days aren't they? Certainly they make a nice gift and even if the giftee has a pair, you can always use more. 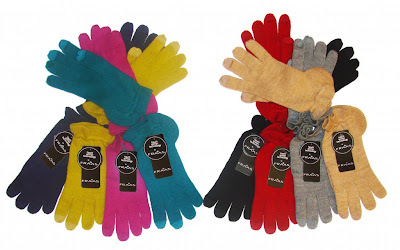 These new touch screen compatible gloves from FRAAS have a ruffle at the wrist , comes in 8 colors and is made of acrylic,poly, and cotton. The touch screen pads are barely visible on these, a nice touch since some have big pads on the fingertips. They're pretty , comfy and work well. 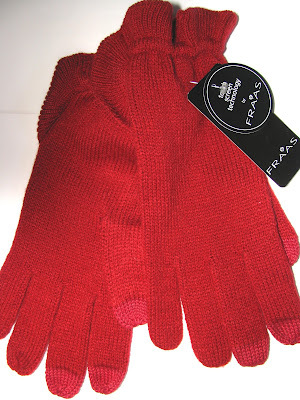 Find them at fraas.com , amazon.com and usually Boscov's stores as well as other select stores. Retail is approx. $ 30 depending on retailer. 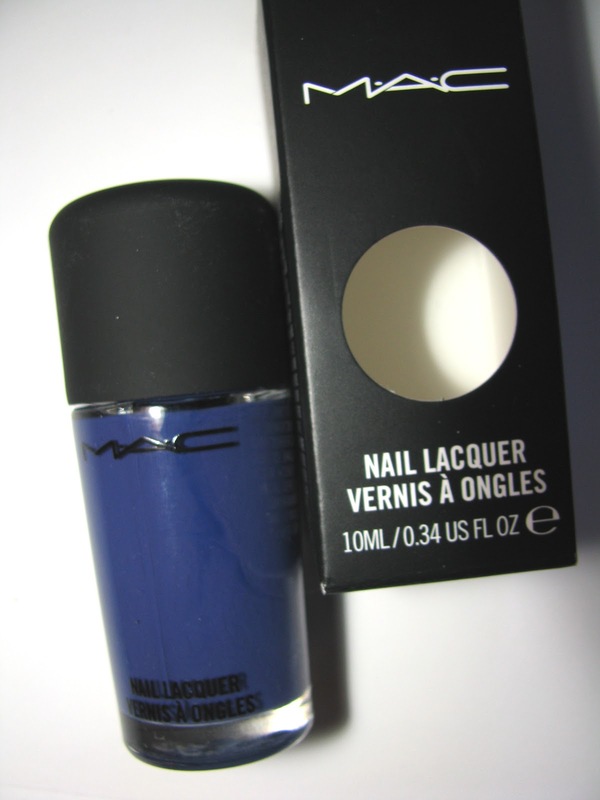 Blue Gaze is one of the two nail lacquers of Taste Temptation from MAC. The other, For Fun, is I believe a re-promote from a few years back. 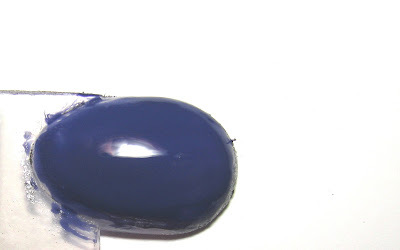 Blue Gaze is a medium rich blue that MAC calls deep periwinkle. Taste Temptations is available exclusively at MAC Macy's counters first as a Black Friday preview. From 12 midnight to 4am only . It will then be available on www.maccosmetics.com Dec. 6th (US only) and in stores Dec. 13 -Jan. 17th. This year even MAC has jumped into the Black Friday fray but they're calling it grey. I am not showing the lipstick because I think the nail polish is the top product here. Grey Black lipstick is just too hard to wear . Grey Black nail polish on the other hand is very nice , if not super unique. It will be unique in that it's a one off. 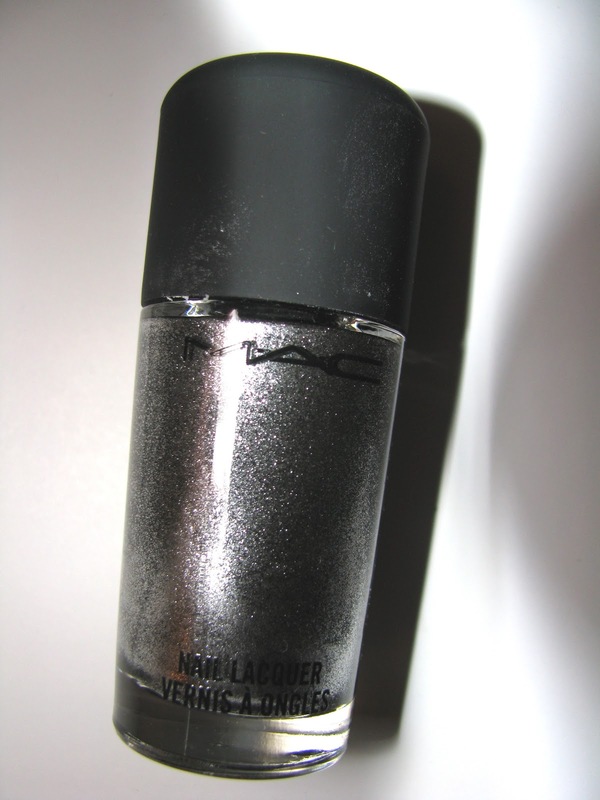 The color is a high frost deep gunmetal that's a nice winter shade especially against wine colored lips. So, will you be indulging in Grey Friday ? Do you remember Jane Cosmetics? If you were a makeup wearer in the late 90s you most likely do, if not, well here's an introduction. 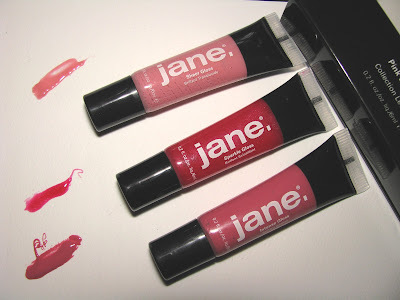 Jane was a fun, very well priced brand found at mass market a few years, umm, decade or more back. Was it really that long ago? Apparently so. Ye Gods. I well remember browsing and buying Jane at Wal Mart ( it was the only local store that had it) back then. Well Jane is back. With a nicely edited line of makeup , still very well priced, that is currently online only but due to hit Ulta in March. Tinted Moisturizer ( 9.99)- This is a pretty typical TM. It's not heavy , a little on the thinner side but not too thin. It has nice coverage , more than you might expect , sheer but there, and moisturizes well . I do wish it had SPF but other than that I like it . 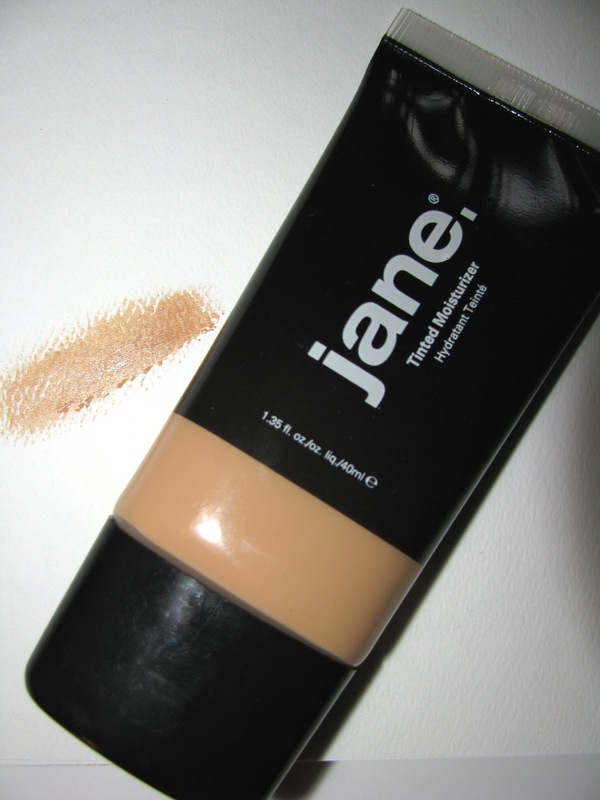 Shade is Light which works well on my fairly pale skin and is lighter than it shows. There are 4 shades. 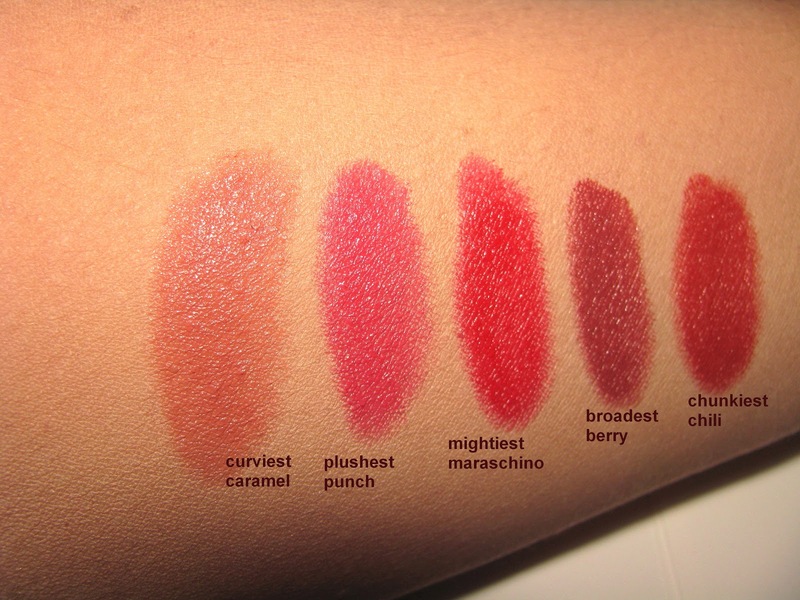 Pink Lip Collection (9.99)- These surprised me with the depth of their pigment. No barely there glosses here . Each of 3 is a slightly different formula. A Sheer gloss, A Shimmer gloss , and a Color Gloss with a vanilla scent. These are showing up a bit red than they are actually are. They are truly pink. There is also a Red and Berry Collection. 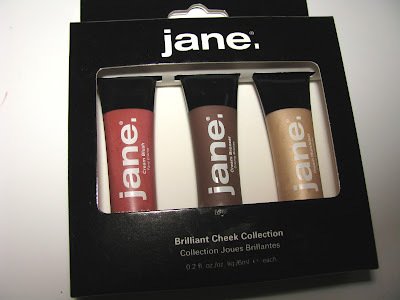 Brilliant Cheek Collection ( 9.99)- This set has one cream blush, one bronzer and one highlighter. All have good pigment . The blush and highlighter blend easily, the bronzer less so. The bronzer also is a bit too brown for most I think, but otherwise these are nice and an easy option to carry in your purse for touch ups. 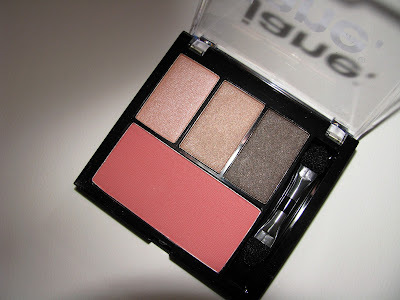 Makeup Palette ( 9.99)- An all in one with 3 shadows and a blush. All colors go on pretty much exactly as they show in the pan, blend well, are soft shimmer and have good pigment. The blush is semi- sheer without shimmer. This color is Natural Palette. There 10 in all. For 9.99, a good deal. We'll file this one under "things I wouldn't mind under my tree this year " . These coffrets hold full collection of Frederic Malle's amazing fragrances. Mr. Malle thoughtfully wanted to be able to offer "the entire store". Musc Ravageur, Une Fleur de Cassie, Le Parfum de Thérèse, Noir Epices, En Passant, Lipstick Rose, Lys Méditerranée, Iris Poudre, Angéliques sous la Pluie, Cologne Bigarade, Une Rose, L’Eau d’Hiver, Carnal Flower, Dans tes Bras, Portrait of a Lady. Musc Ravageur, Une Fleur de Cassie, Le Parfum de Thérèse, Noir Epices, En Passant, Lipstick Rose, Lys Méditerranée, Iris Poudre, Angéliques sous la Pluie, Bigarade Concentrée, Vétiver Extraordinaire, Une Rose, L’Eau d’Hiver, Carnal Flower, French Lover, Dans tes Bras, Géranium pour Monsieur, Portrait of a Lady. There is also a Men's set. 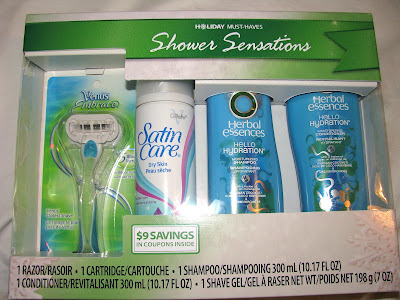 Last year was the first time I noticed the gift sets from P&G brands like Secret, Venus and Olay. I thought then, and still do, that they were such a great value at $10 and would make great gifts, especially for those on tight budgets, which covers many shoppers these days. Yes, they are basic in a way, but they are products everyone uses/can use and done up in a gift set. My favorite is Scent-Sational. 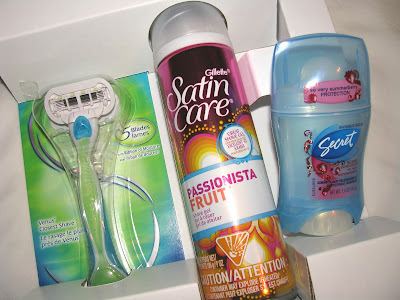 You get a Secret Summer Berry Deodorant , Satin Care Shave Gel in the pretty scent Passionista Fruit and a Venus Embrace razor . Buy these items individually and you'd pay more. The Razor alone is usually more than $10. 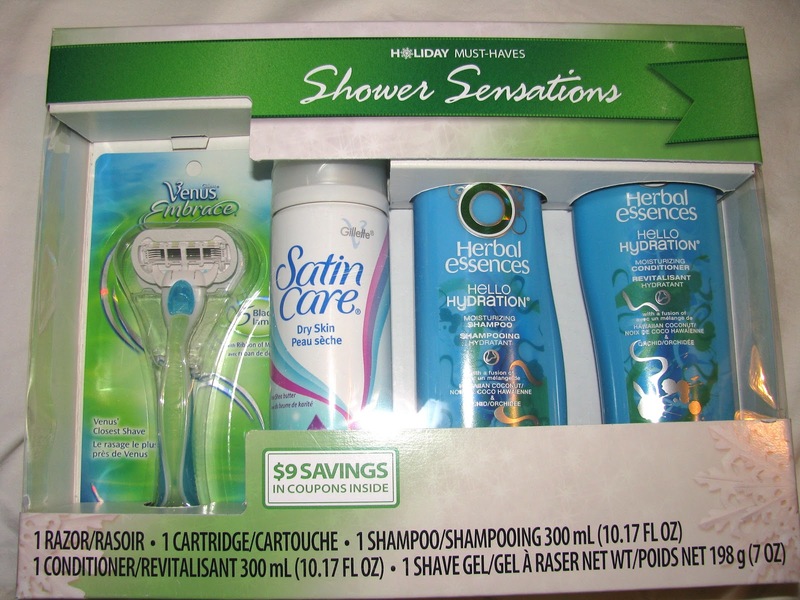 Another nice set is Shower Sensations with full size Herbal Essences Hello Hydration, a Venus Embrace and a Satin Care Dry Skin gel. These can be gifted to so many people. Nieces, babysitter, co-worker who you just want to get something small for ,or maybe your office Secret Santa has a low $ amount. Caregiver, hairdresser, college students, overseas military. You get the idea. You can find quite a few varieties of these including a couple for men and all are $10. Plus most have bonuses included like a free magazine subscription or coupons. Check each box. Find them at all mass market merchants. After posting a sneak of the new Clinique Chubby Stick Intense last week, I now have swatches . I was so excited to test these and they do not disappoint. I am a huge fan of the original Chubby Sticks, as pretty much everyone is . So what's the difference between them ? 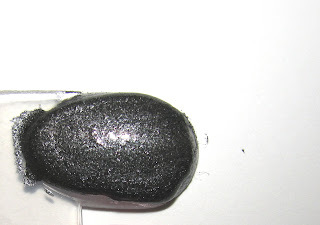 Intense is deeply pigmented , very much like a lipstick. The colors are all rich. 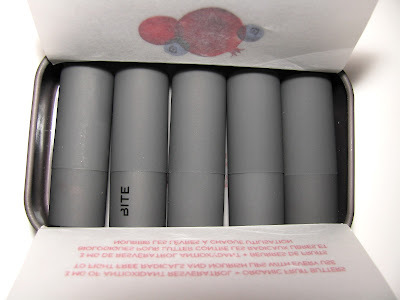 These have full coverage and while the original has a bit of a sheen , Intense has none. No shine or shimmer. They are a satin finish. 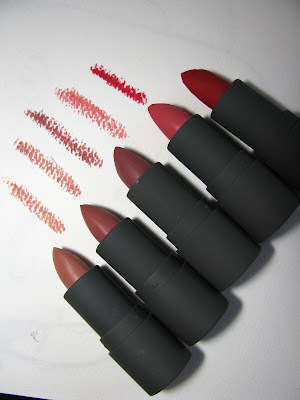 The moisturizing properties are still there , Intense melds lipstick with moisture which is a welcome marriage. Both Chubby Stick formulas have jojoba oil, shea and mango butter for lip comfort and hydration. I think many of us try to figure out how to wear full lipstick but still keeps lip soft in the winter. These are an answer to that. You get both and there have been very few lip products that do that. The wear time here is good, longer than a regular tinted balm due to the higher pigments but not as long as a traditional lipstick. 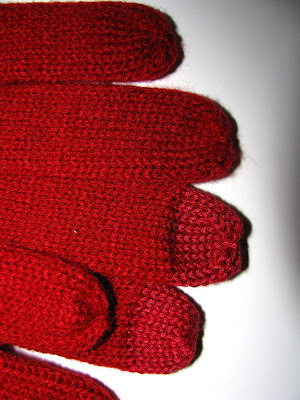 Note that these leave a stain behind when they do wear off . So some color remains and is easily topped off with another coat or a gloss or sheer balm to re -charge it. 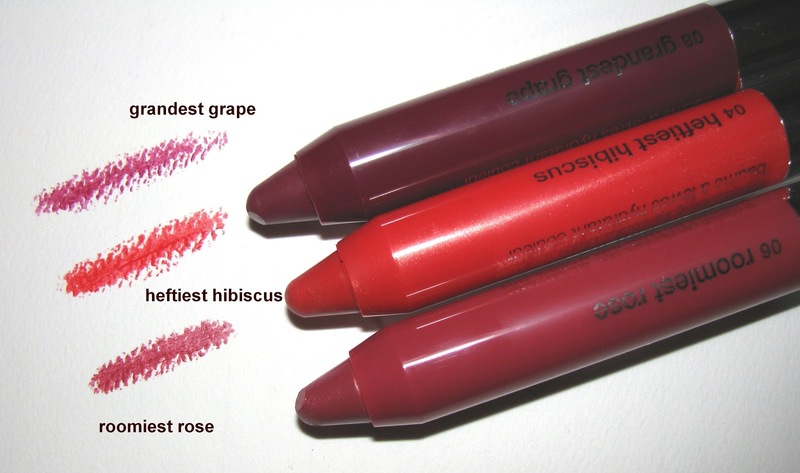 Clinique Chubby Stick Intense Moisturizing Lip Colour Balm will be available in 8 new shades for $ 16. The are supposed to be out in December, but I just saw them for sale online at Nordstrom, so check retailers. Narciso Rodriguez For Her has a lovely gift set ready to give to fans of this easy to wear and popular scent. Gift sets like this make great gifts as they are usually a great value, giving you multiple items for what you might pay for a single bottle. And that's the case here as the 3.3 oz bottle is the same price on it's own. This one has a 3.3oz EDT with a 2.5 oz body lotion and a 10 ml purse spray for on the go . Retail is $ 102.00 at department stores where Narciso For Her is sold. butter LONDON has collaborated with lifestyle website goop, to bring you an exclusive butter LONDON 3-free nail lacquer set. 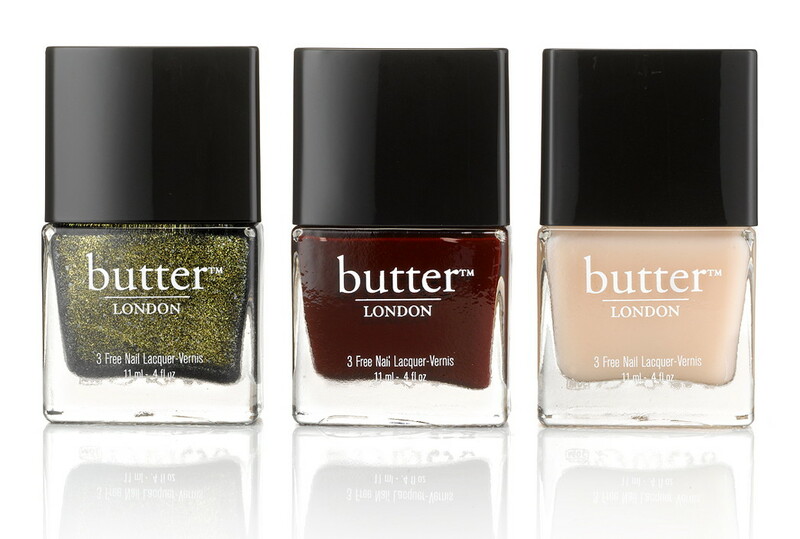 The limited edition set introduces new shades in Hampstead Heath, Bread & Butter Pudding and Abso-bloody-lutely. The set gives you a nice selection - a fun and pretty green, an on trend black red and a pale ivory that is always in style and will be the trend for Spring. The set is for sale exclusively at goop.com for $ 36 and is US only. Stila holiday has some great holiday gift sets and my two favorites are the Seeing Stars Smudge Stick Waterproof Eyeliner Set and the Luxe Eyeshadow Palette. And if you're ready to buy, I've got a reader exclusive 25% discount code just for you. Read on for all the info. 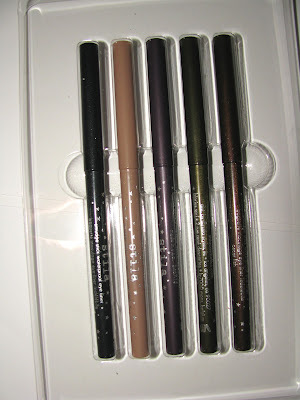 The Seeing Stars Smudgestick Set contains full sizes of five of Stila's signature eyeliners including one , Angelfish, that is exclusive to this set. They are richly pigmented and since they blend so easily and are smudge-able as the name says, they can also be used all over the eye. Stila's PRO makeup artist and all around nice person Sarah Lucero counts this set as one of favorite holiday items and her tip is to use the black one first and then add your color on top of that. The set contains Stargazer, Angelfish,Tetra, Moray, and Oscar Fish and is $ 32. If you head over to www.stilacosmetics.com you can use my exclusive for readers 25% off discount code StilaBA. The code is good for purchases now through Dec.15th . The Luxe Eyeshadow Palette is also a beauty and only available at Stila online. 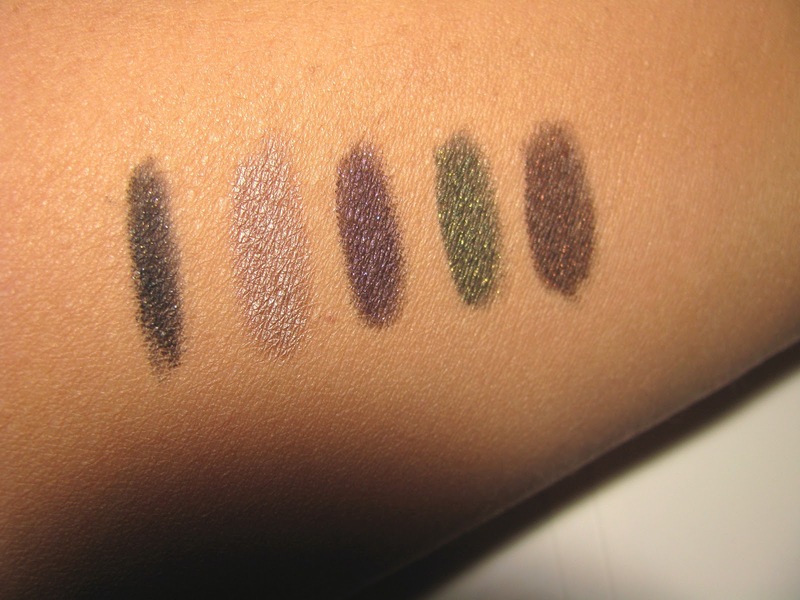 The shadows are cream to powder and matte ones , different formulas than the regular ones. $45. Happy Shopping and if you do buy anything, stop back and share. Remember when Chanel Imitable mascara came out ? It was a huge release in the world of mascara. Since then mascara has exploded to be a huge beauty item on it's own with so many new releases. 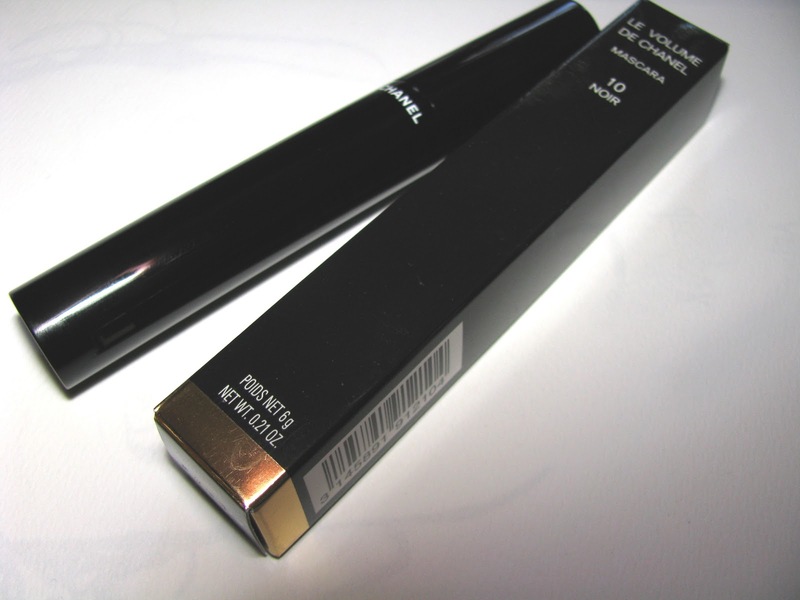 Chanel now has a new one also, Le Volume , a great addition to their line. As you would expect Le Volume is all about volume but it does add some length too. One coat gives you great coverage with full volume but it is buildable for even more oomph. 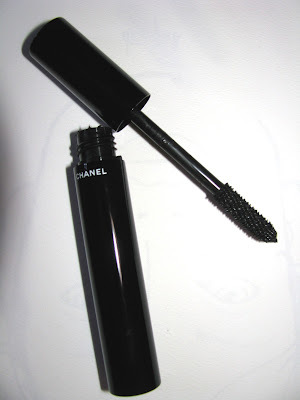 It gives a little curl and has deep pigment for instant dark lashes. I also had no smudging and long wear, very good for a non waterproof mascara on me. 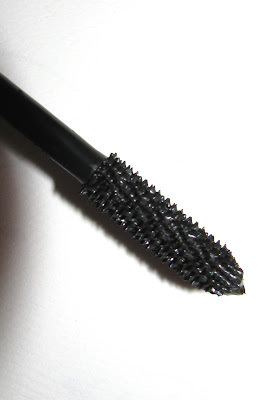 There is a new style brush here, thicker like many of the newer ones are , what Chanel calls a Snowflake brush, with both long and short bristles to get as many lashes as possible. This gives you good definition along with that volume. The formula is wet, but not goopy. As if Chanel would ever be goopy. And can we talk about how chic the tube is ? It's also got some weight to it . Sleek, black and very Chanel.